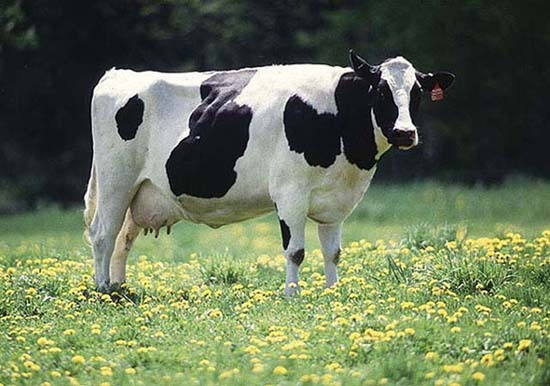 Mastitis in dairy cattle is potentially fatal. Treatment involves long-acting antibiotics (although antibiotics alone are not enough). Some homeopaths, though, believe that magic water (or sugar pills that have come into contact with magic water) can be used to treat mastitis. Homeopathy involves taking the purported ‘active ingredient’, diluting it (usually to the point where not a single molecule of the ‘active ingredient’ remains), and banging the container on, for example, a special wooden striking board covered in leather on one side and stuffed with horsehair (this is what the inventor of homeopathy used). It’s a kind of magic. Homeopaths make extraordinary claims, but their claims are not supported by the available evidence. Some homeopaths have attempted to explain away this inconvenient evidence with extraordinary excuses. Using homeopathy for serious conditions as an alternative to proper treatment really is a terrible idea. And mastitis can be quite nasty. So – what’s the evidence on the efficacy of homeopathic products for cows? Significant reductions in mastitis signs were observed in all treatment groups. Homeopathic treatment was not statistically different from either placebo or antibiotic treatment at day 7 (P = 0.56, P = 0.09) or at day 28 (P = 0.07, P = 0.35). The antibiotic treatment was significantly better than placebo measured by the reduction in score I (P < 0.01). Two-thirds of the cases both in the homeopathy and placebo groups responded clinically within 7 days. In this study, the frequency of clinical responders at day 7 is clearly higher in the antibiotic group compared with the homeopathy and placebo groups even if not significant at the 5% level. From this result and the changes in score I, the antibiotic treatment can be concluded to be the best for improvement of acute mastitis symptoms. However, it is noteworthy that two of three patients not treated by antibiotics could be classified as clinically cured at day 7. It appears that while the effects of the antibiotic treatment could be distinguished from placebo, the effects of homeopathy could not. Two thirds of the animals in the placebo group were responders at day 7, and the same was true of the animals in the homeopathy group. Ninety percent of the animals in the antibiotic group were responders at day 7. The authors point out that none of the treatments showed particularly good effect at day 28 of the study – and call for further focus on the current use of antibacterial drugs in mastitis treatment and a more target-oriented use of such drugs. Full text of papers: homeopathy, placebo and antibiotic treatment of clinical mastitis in dairy cows PDF; Treatment of bovine sub-clinical mastitis with homeopathic remedies PDF. The Quackometer has covered a more recent paper on homeopathy and mastitis in cows. 1. Emphasis added to ‘potentially’ – as pointed out in the comments section, mastitis is only rarely fatal. 2. Typo corrected – ‘homeopathy’ in the sentence referring to the Quackometer’s post. There’s also this article on homeopathy for diarrhoea in calves. it seems you have been reading the same stuff i have over the last couple of days. Terrible and illegal according to the Animal Welfare Act (AFAICT). And I’m shocked if the scientific research exemptions in that Act are being abused in order to permit unethical pathological non-science CTs of homeopathy. They’ve been using it on cows for years with predictable results. Clearly stuff and nonsense. I am a little perturbed by the tone of the piece suggesting mastisis is a killer. Economically it is a major problem and yes in extreme cases it can do real harm but please don’t exaggerate its effects. Most cows that die as a result of this disease do so by captive bolt. Farmers have contracts requiring them to keep their somatic cell counts below a certain figure. Often the most cost effective way to deal with the issue is to test the cows individually and cull those with high counts even if they are showing no clinical signs of illness. The limits are somewhat arbitrary and so far as I am aware have no scientific basis. Arguably they are simply a mechanism to keep payments for milk suppressed. Anyway I digress please don’t exaggerate the effects of this disease. Thanks for this one, James – very useful. He only said it was potentially fatal and that it “can be quite nasty” – hardly an exaggeration. AFAICT the studies involving sick cows appear to have taken place in countries outside the jurisdiction of the Animal Welfare Act. Thanks for this one – very useful. Careful with the weaselling. “Potentially fatal” is a heavy duty phrase for something that is rarely fatal without adding farm economics. Second-to-last paragraph phrasing seems a bit off; I take it you mean that by day 28 there was no real difference in effect between the three groups, rather than that there was no good effect? So we can say that antibiotics speed recovery time (slightly) ? I’ve only had a glance through the report and it looks like they sampled on day 0, day 1, day 7 and day 28, so it’s not clear to me if that can be said confidently. No weaselling intended. I’ve now added emphasis to the word ‘potentially’ and noted that mastitis is rarely fatal. None of the treatments in this study can be claimed to show particularly good effect regarding outcome at day 28. Along with the high clinical cure rates at day 7, also in the homeopathy and placebo groups, the poor outcome at day 28 in all treatment groups calls for further focus on the current use of antibacterial drugs in mastitis treatment and a more target-oriented use of such drugs. I’ve just read something in yer favourite newspaper about treating an ex circus elephant with reiki and homeopathy if you’re interested. Ha, yes: so there is. I see they’re actually using qualified vets as well as the experts in magic, so at least they’re just wasting money on complementary ‘treatment’ rather than denying the elephant proper medical care. Hang on though, the milk from the homeopathy-treated cows would contain an even more dilute solution of the remedy, and dilution means potency, so those cows would be churning out super-milk able to cure all bacterial infections? The title of this blog? Stuff and Nonsense. ’nuff said. as for PHayes comment, not sure whether it’s meant to be funny or clever, but it isn’t, and it won’t be happening. The RSPCA have already tried and failed. http://bit.ly/hjeP5K If you were to talk to the defendant who was fully acquitted, you would be better informed. I’ve said all that needs to be said in past posts. Refer backwards please. And leave those who are working successfully with homoeopathy in livestock to carry on doing so, and we’ll leave those using other forms of medicine to do what they’re doing. I’ve provided these links and comments for your further enjoyment. As I said above, I’ve made my point previously. Refer to them if you want to continue the argument with yourselves. Stuff and nonsense? It’s all a question of how one of approaches issues and solutions. Just like in many walks of life, different people have different ways of doing things, both achieving the same end result. I prefer to let those who wish to do something their way, and to find it efficacious, get on with it. @Oliver, I took the time to have a look at some of the links you posted; wow. On this page here, http://www.hawl.co.uk/homoeopathy/homoeopathy-on-the-farm/, it refers to a major study at “Bristol Homeopathic Hospital clearly showing an extremely positive response to homeopathy”. The problem with all of these deluded vets of course is that lots of the time, both people and animals just get better, even if they don’t get any medicine. The way this site pours scorn on the RSPCA is just outrageous though! Good for the RSPCA to stand up for what is right. Do you know what they call Alternative Medicine that has been proven to work? They call it Medicine. I’m glad you looked at the material provided through some of the links. I’m sorry that you think that the professional veterinary surgeons, trained both conventionally and in homoeopathy, are deluded. I could say the same of those who don’t/won’t believe what those professional veterinary surgeons have witnessed and reported. Still, I appreciate that I can’t make you believe what you don’t want to. Closed minds often stay that way. You may say that I have one, but I can assure you that I’m open to everything. I just happen to understand that there is much that people don’t understand about things which mystify them, and it’s often easier to debunk them than to try and understand them. As you say you took a good look at the website, I’m sure you’ll have read the reports posted by the veterinary surgeons, and those of many of the farmers who have been on the courses. You mention the RSPCA, and to my knowledge none of those who have attended one of the courses has ever had any difficulty with them. Perhaps you know otherwise. You say “that lots of the time, both people and animals just get better, even if they don’t get any medicine.” That is undoubtedly true, and I’m sure we all agree on that. However, it is what happens in all the cases where they don’t “just get better” that is of relevance. As you will doubtless have read in many places, both pertaining to animals and humans, there are countless cases where conventional “medicine” has been unable to provide a resolution of an illness or condition, and it is for some of those cases where homoeopathy has resolved deep-seated problems, some of which have persisted over a long period of time. I personally know one deep-seated sceptic who after many years begrudgingly went to a homoeopath, upon his daughter’s insistence, and his persistent coughing problem, for which the doctors had told him there was no further option available to them, was resolved within a week. Maybe it was a fluke, but he is no longer sceptical, even though he doesn’t understand how or why. Your last line is wrong. In the case of homoeopathy, you might think of it as an “alternative medicine”, but I think you’ll find most homoeopaths would consider it to be “homoeopathic medicine”. I’ll leave you to your version of medicine, accepting that is adopted by most people for varying reasons. how about a comment about the research above then? does homeopathy work for mastitis in cows as shown in these studies? Your cough-suffering acquaintance was never a sceptic, Oliver: he was a doubter who lacked the knowledge and critical thinking skills that would’ve saved a sceptic from being led into delusion so easily and by such a glaring failure of logic and reason. Prof. Michael Baum gives an amusing anecdote in a similar vein in one of these http://www.youtube.com/watch?v=grWfxsFWOFI&feature=autoplay&list=PL13C076E8CE7FCD4D&index=1&playnext=7 videos (sorry I can’t remember which) about an incident in which he narrowly escaped acquiring a false belief in the efficacy of acupuncture (although of course he almost certainly wouldn’t have been fooled). simple responses……………. all that is warranted. If you’re going to refer to the vets practising homoeopathy as “deluded”, either directly yourself, or through reference to somebody else’s post, you don’t deserve further comment, and won’t get it. In fact, you don’t “get it”. I’m not asking you to, it’s your loss, and it tells me a lot about your way of thinking.regarding the “deluded” vets. You can easily find out who they are. Why don’t you write and directly accuse them of being “deluded”? As for phayes dismissal of my “acquaintance” as “never being a sceptic”, you must be indulging in some sort of psychic process. You’ve no idea who I’m referring to, you’ve never met him, never discussed his case with him, and yet you presume to .he may have once been a doubt, but you criticise him and dismiss his opinions etc. You consider he lacks the “knowledge and critical thinking skills” to make a relevant judgement and that he is “deluded”. You like that word, don’t you. As a college lecturer, widely respected by his peers, I suggest you think of a better way of referring to people you’ve never met. In fact, that was pretty cheap and pathetic, almost tabloid. I’m sure that “skeptivet” has written what you would consider to be “some sensible articles on homoeopathy”. I’m sure also that you lap up anything that “Quackometer” writes, and comments aired on Bad Science. The interesting thing is that both of them choose to write on the subject about which they analyse and criticise within their paradigms. That’s right, Oliver: I used my psychic powers instead of mundane logical reasoning and inference on the information you gave. Strange – given that my possession of such powers is a little more plausible than homeopathy – that you seem to have meant that sarcastically. Even more so given that you go on to use your own psychic powers to delve into the contents of my mind! BTW, providing more personal detail about your anonymous acquaintance now isn’t going to help make my reasonable observations look like an unjustifiable personal attack. I suggest you think of a better way to conduct your arguments than with risibly cheap and pathetic attempts to squat the moral high ground. “risibly cheap and pathetic attempts to squat the moral high ground”………. me?? Ha ha ha ha!! I leave that to others to do………………..who seem happy to do…………. If I recall correctly, you maintain that the perceived effects of homeopathy cannot be accounted for by the placebo effect (or any of the other factors I’ve quoted in previous discussions with you such as regression to the mean etc). You seemed to be of the opinion that the placebo effect could not be relevant to observations of improvement in sick animals. Do you have any comment on the studies I cited that showed that the patients given placebo fared as well as those given homeopathic remedies? No, I don’t have any comment as they are about human patients, of which my experience is limited. With hundreds of cows in a herd, or thousands of hens in a flock, I don’t recall having seen regression to health! Dead cows, maybe, if untreated. Placebo for cows? Hens? Pigs? I think not when talking about these animals as part of large groups, or individuals. I’m sorry these animals work against how you think they should. they are not studies done on humans at all…. have you read the topic at all or do you just go to the thread and start posting away? they are three studies on cows and homeopathy. i think you need to read or at least browse them before making unfounded judgements of how you think animals respond. Sorry – I’ll try to be clearer. When I referred to “the studies I cited” in my earlier comment, I was talking about the studies linked to in the above blogpost, titled “Homeopathy for Cows”. The patients (i.e., the cows being studied) given placebo fared as well as those given homeopathic remedies. What are your thoughts on this finding? If you’d like to take some time to read the papers the above blog post discusses before commenting further, can I just point out that there are links to the full text versions of two of the papers at the bottom of the post? The Klocke trial seems to make no sense. They preselected the remedies they were going to use, and expected to get positive results. That’s not how we treat dairy cows with homoeopathy. We inspect the foremilk in each quarter of the udder, and assess the type of mastitis the cow is suffering. We then selected the correct remedy for that type of mastitis, for that type of care (assessing its temperament). You may find that not relevant, but we most certainly did, and that is a large part of why we had so much success. You can’t generally go around giving blanket remedies to resolve any particular illness. So, on balance, I’d rate this trial is very poorly prepared. As for the trial by Holmes et al, this was purely working on the basis of prophylaxis. To what extent they assessed the animals and selected the right remedy for the prophylactic treatment, I do not know. From what I read, it didn’t look like a trial that I would be expecting to see scientists undertaking. I wouldn’t expect to find prophylactics treatments alone having an impact on the SCC. the kind of evidence that I prefer was the high-volume of cases which we were able to treat, as do all dairy farmers using homoeopathy,by correctly assessing the animal, and the type of mastitis, and providing the animal with the best remedy. Oliver – you seem to be uncomfortable with the notion of an RCT and to prefer to rely on anecdotes. Please explain why you think that anecdotes are more reliable than controlled trials. of course they are just homeopathic handwaving answers that have no bearing on how you really operated on your farm are they. You have already said that “We adopted some prophylactic treatment for the widespread illnesses, by placing remedies in the water troughs” and your loverly video on ringworm in calves using Bacillinum “where as all we would be doing was putting this remedy in a water trough and the job was done”. baccillinum is a homeopathic nosode. so come on, stop using the homeopathic handwaving answer and at least try to remember what you did on your farm. which will be advantageous ‘in respect of lowering cell counts and maintaining both low counts and reduced incidence of mastitis’”HANSFORD, P. & PINKUS, T. (1998) The Herdsman’s Introduction to Homoeopathy. London, Ainsworths. pp 26-32.
oh look its the herdsman book. i am sure you have mentioned this before in one of your articles: “The Herdsman’s Guide to Homoeopathy”, which came to serve us as an initial “bible”. seeing how the remedy perfomed no better than negative control (ethanol and tap water against ethanol, Udder care and tap water) under controlled conditions are you know doubting the book and the remedy as not being effective and useful in the treatment of mastitis? as for klocke, we know your stance on using blanket remedies as you used them all the time. now your saying you cannot go round doing that…which is it? but again you would have thought klocke being Dr. med. vet., Head of group, animal health, herd medicine, homeopathy, mistletoe therapy for domestic animals at the The Research Institute of Organic Agriculture (FiBL) and member of the international association for veterinary homoeopathy (IAVH) and the rest of the team at FiBL, except “Heil, F” would know a thing or two about homeopathy, prescribing and cattle wouldn’t you. Maybe you can send them a copy of your “bible”. as for Hektoen they did everything you wanted them to do. A trained homeopath accessed the cows and prescribed a remedy accordingly from a range of 64 remedies.These remedies were pre-selected by a homeopath, based on which remedies he experienced as most commonly used in treatment of mastitis. Homeopaths were in constant contact with the farmers and the remedy was changed if necessary. The only difference was that the homeopath and farmer did not know if it was placebo or not. Now i notice you use the “reliance upon RCT methodology” canard. what is so different about this trial and what is happeneing on organic farms, other than the farmer or the vet not knowing if it is placebo or remedy? There is no difference is there. Its still not good enough for you though is it. You would have thought there would be more of an effect in the homeopathic group given the individualised approach they used. but my main question is that animals got better either in untreated groups or in placebo groups in these studies. how do you account for this as you have already stated many times that animals do not get better on their own or respond to placebo treatments? I’m not sure what your objective is, but your tone is decidedly unpleasant and uncivil. Some of the things you say, over with the tone of somebody who is intent on bullying somebody else into submission. You are absolutely right, I have mentioned at the “The Herdsman’s Guide to Homoeopathy” before, and yes, it’s an incredibly useful book. I didn’t intend to give the impression that we relied solely on nosodes as our homoeopathic policy. We certainly didn’t. It was an adjunct. We did use them all the time, but, whenever we had a clinical case we backed it up with an individual clinical treatment with homoeopathy. Highly successfully.. Although, it has to be said that with the ringworm, it was sufficient on its own as a nososde, not just for my cattle, but on many other farms. You can say what you like about the trial you found, but I can tell you that it doesn’t make me “doubt the book”. When I refer dismissively to the RCT methodology in terms of trialling homoeopathy, I do so because it is not applicable compared to the cases where one might be trialling an individual remedy. Just because you found a trial, where you think you found somebody using the same methods that I might have used, you think you can bully me into saying what you want to hear, and that I will miraculously deny that all the things that happened on our farm with our animals, thereby conceding that our people were all delusional, liars, and that the cows were deceived etc. Time you accepted that there were some other ways that worked in treating cattle illnesses without reliance on drugs, even though you haven’t got your head round the fact. I’m well aware that many people who use homoeopathy do not understand the fine detail of its modus operandi. Me included. We don’t have too in order to use it. If it works, reliably and repeatedly, then it ought to be perfectly possible to use it and hope to understand the mechanism at a later date. Much as has been the case with many “drug” discoveries and applications over many decades. Oh, and of course, the same would apply to many other forms of medication, including herbal usage. It’s important to remember that many of the drugs that we currently see in conventional medicine are derived from plants. It’s only when the company manages to distil out a key ingredient that they’re able to patent the drug. The herbalist cannot patent the plant. So, with reference to your main point, as you put it, I don’t have any difficulty with whether animals got better in the placebo group, in the study that you refer to. You find me a veterinary surgeon who would suggest giving up using drugs in preference to placebo, as a policy for a farmer. If I’m not mistaken, some of those who reside in the same mental space as you do, are incredibly quick to damn anybody who forsakes “proper medicine” whilst trying to treat something with homoeopathy from which the patient may then have suffered serious consequences or perhaps died. As you consider that homoeopathy has nothing in it, presumably you would consider these people to be using a placebo. @David. You are quite right, I am uncomfortable with the notion of an RCT with regard to homoeopathy. However, don’t give me that BS that I’m referring to homoeopathy as anecdotal. Just because homoeopathy works against all you done in your professional life, and all that you understand of how things work, doesn’t mean that there isn’t a new and other way. Imagine that when penicillin was first tried by Alexander Fleming, and the medics of the day dismissed it as anecdotal, with the treated people but the medics dismissing their recovery as placebo, just because they didn’t understand the drug, and because it was never trialled using an RCT. Whilst I have pursued this line of argument longer than I had intended, it strikes me that you are now trying to become living proof of the efficacy of brainwashing! And, as I said at the beginning, to a degree using bullying to get me to say what you want to hear, and then perhaps quote widely. Much as you and your cohorts might be trying to get me to say that homoeopathy doesn’t work, hell will freeze over before that happens. I can’t deny what I and my many staff repeatedly undertook, observed, and appreciate. I saw my ex herdsman recently (remember, I haven’t had cows since 2004) and he was horrified to think that there were people saying he (and those he worked with) was a liar, that he was deceived, and that homoeopathy didn’t work. He is still enjoying using it on one of the herds where he now milks, in the same parish I live in, on a part-time basis. “Those who make recitals of miracles decrease rather than augment the belief which they wish to inspire; for then those recitals render very probable the error or the falsehood of their authors. But that which diminishes the belief of educated men often increases that of the uneducated, always avid for the marvelous.” –Pierre Simon, Marquis de Laplace: A Philosophical Essay on Probabilities, Chapter XI. Concerning the Probability of Testimonies. Ringworm is self limiting so anything can been “seen” as being affective. i cannot believe that in organic farming or any other farming that other disease control and prevention interventions are not used. i cannot believe that the animals are not monitored and the lesions checked regulary and individually treated if need be by other means. it seems a shame given our knowledge of ringworm is ignored and that they are left with just a remedy in the water and left to get on with themselves. Any new cases that occur due to contamination of where they are housed are just treated the same….such a shame. so you do not doubt the book even though it makes wonderous claims for products like Udder care, how about “udder care” then? there are some great ancedotes on the ainsworth site such as those from Iranian farmers or Uk famers which does not match the scientific evidence. Is Anisworth’s “udder care” effective? its marketed as being effective through anecdotes? It is in the Ainsworth’s produced herdsman book as being effective anecdotally….not that i expect you to say that “udder care” was shown to to ineffective. what you could say is that i am being uncivil and bullying you into making a decision on research that has been presented and what the implications are of the outcome of it against all these positive ancedotes. so what your saying is that the Holmes paper is rejected because it makes you uncomfortable commenting about the method used, results of it and the effect this would have on your “belief” in homeopathy then. Strange, i thought you would have come up with sometyhing better than that. i mean all the supporters of homeopathy like to bash studies for whatever excuse they can, but obviously the method they used has hit a nerve somewhere. Animals got better in ALL of the studies either in placebo or untreated groups. The rate and frequency they recovered was no differently to those given homeopathic treatment. now i am well aware that people would have explained to you a long time ago the unethical nature of doctors/vets prescribing placebos so i am not even going to reply to that comment. what i would say is the reverse: can you find a vet or a dairy farmer that have given up using conventional medicene completely and utterly because homeopathy works so well? Does such a vet or dairy farmer exist that has totally rejected the use of conventional medication under any circumstance? which is seen as a welfare issue in animals? denying the animals homeopathy or denying the animals conventional treatments?. quick to dam them for using woo? i believe that the majority of people have the capacity to make their own choices, especially ones concerning health. For those not included in what i see as the majority there is the mental capacity act 2005 to help them. The problem is with the information they are given. Are they given all of the relevant information to make an informed decision? is this information explained or presented in a way that is easy to understand? who is it that is giving them this information? With alternative medicene this is simply not the case. Anecdotes do not count as having all of the relevant information. What you would have to do is take ALL the information available and then be able to make an informed choice. People have the right to make poor decisions as long as it is an informed choice that includes all of the relevant information. like using things like Udder Care, nosodes, or individualised homeopathy to treat mastitis for example and not rejecting the scientific evidence for it and just relying on ancedotes. As you consider that homeopathy has something in it maybe you could share why you think homeopathy should soley be used for potentially fatal diseases? of course you could say that i am being uncivil again and bullying you into saying something you do not want to say. if you have any evidence other than ancedotal that these “other ways” worked and are more effective than placebo then why not present it. i am sure people would be happy to look at it, i would be. the problem is that these ways you mention are more of often than not support by very poor quality evidence and anecdotes while rejecting and ignoring conflicting good quality evidence. nothing like finishing off with one of your “interesting” anecdotes is there. I’ll leave you to call what you like an anecdote. We’re never going to agree on that one. You may think the people using homoeopathy for their livestock aren’t making informed choices, I disagree. However, your suggestion that I find somebody who is only using homoeopathy is ridiculous, and I suspect you know it is. I’ve never once suggested that there would be a farmer anywhere who would rely wholly on homoeopathy to treat the illnesses and other conditions in their livestock. I very much doubt there’d be a veterinary surgeon who would do that, anywhere in the world, and I certainly don’t know any. Those who embrace homoeopathy know that they have two ways to deal with illness. Those who refute it have only one. It is not a case of us both disagreeing on what is an ancedote or anecdotal evidence. The disagreement is between you and every dictionary in the world past and present. if you care to look it up you will see how my use of the word anecdote is in every dictionary definition. Try looking at anecdote, anecdotal or anecdotal evidence and see if you can find one that agrees with you. Seeing how i have defined what i believe to be informed choice then maybe you should have a go at it, because if i reply to what you just said you may call me uncivil again. of course people using only homeopathy is ridiculus because it is an animal welfare issue to refuse to use conventional treatments when they are required. you cannot say the same for homeopathy can you. Those who look at the evidence base for homeopathy find that in good quality trials it is ineffective. Those who reject the evidence but still choose to use it have two. but to embrace homeopathy one would have to reject many things beyond its inability to show an effect when adequate controls are used. Which ties in nicely with the main article once again. Homeopathy as outlined in the three research articles aboves does not work either indiviualised, using nosodes etc. So a choice is made to use an ineffective treatment instead of an effective one, when the ineffective one fails you can always use the effective one. Again it is not disagreeing with me it is disagreeing with the evidence presented, do you have anything other than more ancedotes to dispute the evidence presented? We’re never going to agree here. It is you who considers that the results observed that my many staff have seen, all the homoeopath veterinary surgeons all over the world, all the farmers employing homoeopathy, who globally can be counted in hundreds of thousands if not millions (including India), should be considered anecdotal. You are welcome to this opinion, but all those who witnessed the results in using homoeopathy would disagree with you, just as you disagree with them. That is a straight impasse. Please note that I’m not saying that “anecdotes are more reliable than controlled trials”. I am saying that homoeopathy has an impressive record in treating illness and animals, and due to its individuality both in diagnosis, remedy matching, and administration is widely understood by homoeopaths to be not	suited to being trialled with RCT’s. That does not mean that results gained are anecdotal. Clearly you’re going to continue to believe that they are anecdotal. Clearly I’m going to continue to stand by what I have witnessed, as have the hundreds of thousands of others, over many many years. You accuse me of denying the evidence you present. I could equally easily accuse you of denying the results achieved/witnessed by the vast numbers of people successfully using homoeopathy. Hence, it’s fair to say we are at an impasse. were are not at an impasse at all. you are presenting your opinions, where as i am not and that is the difference. All you are doing is trying to redefine the definition of Anecdotal evidence to suit your own view point. I do not have to “believe” that they are anecdotal, or is it my “opinion” it is what i consider them to be, it is how they are defined. like i said if you can produce a definition of anecdotal evidence that fits your view point then do so, there are plenty of dictionaries etc out there to choose from. Excuse #1 – You can’t test homeopathy in a randomised controlled trial, as it is individualised. i do not deny the results achieved witnessed by the vast numbers of people successfully using homeopathy do i? i just use the correct terminology and definition and call it anecdotal evidence and once again until you can find a better definition for them then they will always be considered, definied, explained as etc anecdotal evidence. can you say the same for the evidence presented in the main article, no, you just reject it.